As the saying goes, rules are made to be broken. From the very beginning of Optics4Birding, our policy for reviewing optics has been to never compare products of different brands with each other. However, since one of these products is no longer available and the other is a nearly perfect replacement, we’ll do it this time. One of the most popular lower-mid priced binocular series over the last quarter of a century was the Eagle Optics Rangers. The Rangers went through several iterations over the years, starting with a rebranded Celestron Regal and ending with the house-designed Ranger ED. With the closing of Eagle Optics, the Rangers ceased to be available. So, you can imagine our delight when we discovered a suitable replacement in the same price range! 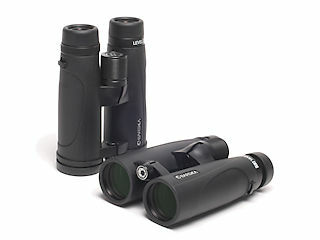 Enter the Barska Level ED Open Bridge 8x42 $349.99 and 10x42 $349.99 binoculars. We’ve known Barska since we opened. They were known for very-low-cost binoculars most of which didn’t spec out as being birder friendly. The Level ED is very birder-friendly, a welcome departure from Barska’s standard fare. They also come in an 8x32 model $279.99 with the same glass, but its smaller size eliminates the need for an open bridge. We received a 10x42 model from Barska for review. Since we were hoping for an Eagle Optics Ranger replacement, one of our staff members brought in a most recent version of the Ranger ED 10x42 for comparison. The optical specs between the two are virtually identical with very similar eye relief (15.5mm), field of view (341’ at 1000 yds.) and close focus (6’). Phase- and dielectric-coated prisms and proprietary multi-coatings on the lenses made them virtually impossible to tell apart. We did some of our testing by viewing some backlit kangaroo paws plants outside our front door. Both binoculars showed crisp, vivid views of the little white hairs on the plant’s stems and petals. Even the spider webs between petals were impressive. Colors were neutral and well saturated. 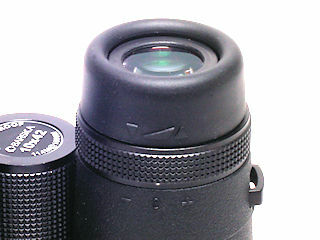 ED stands for Extra-low Dispersion glass in the objective lenses. The purpose of ED glass is to reduce the angular spread of white light into its component colors when it passes through the edges of the objective lenses. This effect is called chromatic aberration and manifests most visibly as fluorescing color along high contrast edges in the scene because the various colors focus at different distances from the eyes. Broader bands of color mean the eyes and brain have to work harder to try to bring the colors back into white light resulting in eye fatigue. ED glass comes in many versions and quality levels. As the price goes up along with the quality of the glass, the bands of color become narrower Chromatic aberration, while still present, was significantly reduced compared to non-ED glass. Barska took a very innovative approach to two other things that impact ease of use, one of which we really liked. The eyecups adjust with the usual helical twist mechanism, counter-clockwise to extend and clockwise to retract. What’s unusual about this is that they have 5 stable positions between fully up and fully down. All are marked by firm detents, and the eyecups don’t collapse unintentionally during normal use. Basically, these are excellent eyecups! The diopter adjustment is a simple twist ring on the right barrel. It’s non-locking, but quite firm, so it tends to stay where you put it. It’s a simple, functional mechanism, but nothing fancy. As do most modern eyecups, they adjust up or down with a helical twist, with small detents about half-way through the travel to allow for an intermediate length for some eyeglass wearers who require some extension. The eyecups have a smoothly rounded edge and feel comfortable against the face. The diopter control is on the right eyepiece. It is stiff enough to keep the setting from drifting, but not so stiff that you think it’s stuck. 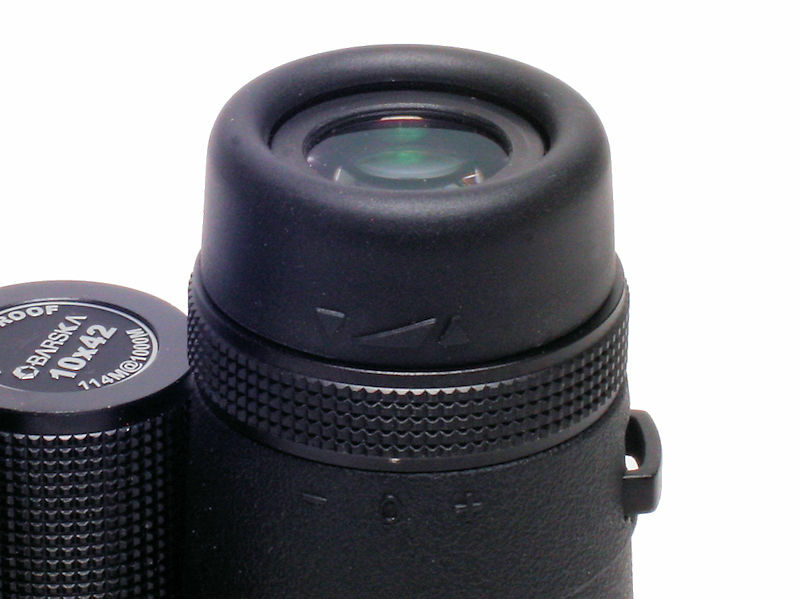 The diopter ring has a little white dot that sits over a “– 0 +” scale on the binocular tube. While we do not recommend sharing your binocular, if you can’t remember your diopter setting, put a small drop of nail polish on the barrel to assist you in returning the diopter to your proper spot. The first peripheral you encounter when unpacking most binoculars for the first time is the case. The one supplied with the Level ED Open Bridge is molded into a clamshell-like zippered box with rounded corners and covered with some soft, black material. The zipper can be closed from either end, or both ends and meet in the middle. The top of the case has two D rings for attaching an included shoulder strap. There is also a short nylon web strap between the D rings for carrying by hand. Inside the case is a mesh pocket that runs the width of the case, and a pair of Velcro straps that keep the case from opening too far when they are stuck together and allow the case to open fully when they are unlatched. 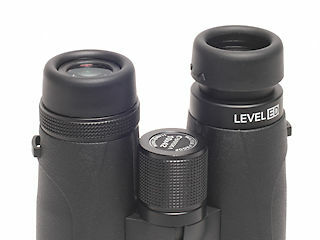 The lens covers are of the typical design seen on most mid-priced binoculars today. The rainguard consists of two cups that fit snugly over the eyecups and are connected by a flexible bridge. There is a solid loop for threading a strap through on the left cup and a split loop on the right one. This allows the rainguard to be hung off the left side while you are viewing. The objective covers are tethered to rings that wrap around the binocular barrels, so the caps are ready when you need them. 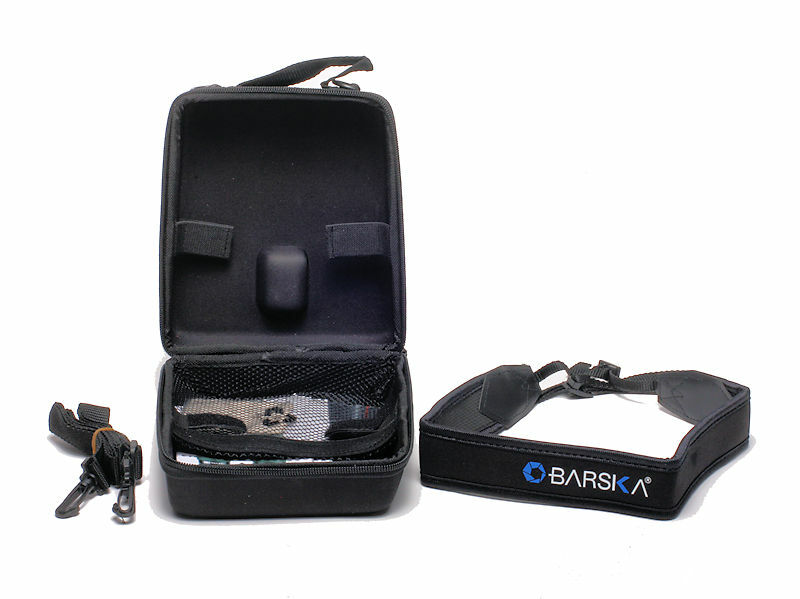 The neck strap is covered neoprene with leather-reinforced connections to thin nylon web manual, and the Barska Limited Lifetime Warranty card are also included. The Eagle Optics Ranger ED binoculars were the champion of the mid-$300 price range. We are excited that the Barska Level ED 8x42 Open Bridge $349.99 and 10x42 Open Bridge $349.99 binoculars have stepped in to fill the void left by Eagle’s departure. If you’ve tried a friend’s Rangers and liked the performance, this is the binocular for you.